Watercolour drawing with pen and ink of a sculpture of a lion upon an elephant in the Surya Temple at Konarak in Orissa, by an anonymous artist, part of the MacKenzie Collection, from an album of 37 drawings (43 folios) of sculpture at Jajpur, Puri, Bezwada and Sitanagar made during a journey from Bengal through Orissa to the Coromandel Coast, dated 1815. The great Sun Temple of Konarak stands on the Bay of Bengal, where thousands of pilgrims still come to bathe in the water during the spring festival to celebrate the birth of the Vedic sun god, Surya. The temple was constructed by Narashimhadev, king of the Eastern Ganga dynasty in the 13th century. Conceived as a gigantic chariot with twelve pairs of carved wheels, this temple is an architectural feat for the Orissan style. It originally consisted of a sanctum with a spire reaching more than 70 metres, an assembly hall and a dancing pavilion as well as a number of subsidiary shrines. The sanctum and the dancing pavilion have lost their roofs and it is only the assembly hall which has survived with its large pyramidal roof, the exterior of which is decorated with sculptures of musicians, dancers and maidens. 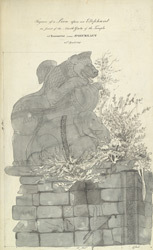 This drawing depicts one of the two guardian lions that guard the entrance of the dance pavilion.